The 2015-2020 Dietary Guidelines for Americans recommends that consumers reduce their sodium consumption to less than 2,300 milligrams per day, causing the need for a reliable alternative to salt. Permeate is a tasteful, cost effective solution to sodium reduction and the salt substitute both manufacturers and consumers are looking for. 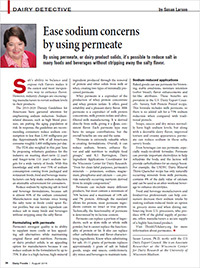 Download the August Dairy Detective for information on permeate and its ability to replace up to 75% of sodium in formulations without eliminating the desirable salty taste.